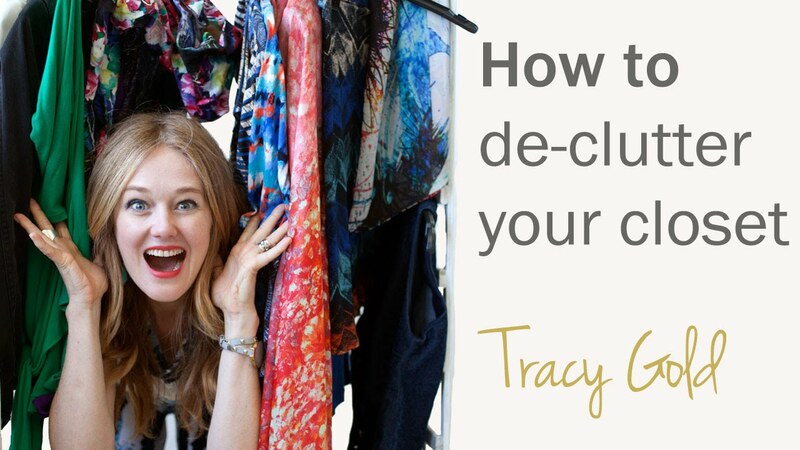 Do you have a cluttered closet, that you can't even see what you have? In this video I am going to tell you how to de-clutter and downsize your closet so that it only contain clothing you really love and wear. Does your closet look something like this? In this video I am going to tell you how to de-clutter and downsize your closet so that it only contain clothing you really love and wear. If you have a cluttered closet, it can cost you money, time and make it hard to get dressed in the morning. Here is my easy 5-step method to clearing your clutter and keeping it that way. Step 1: Clearing out your closet can be an emotional experience. Often our closets are filled with clothes we used to wear, sizes we used to fit into or clothes that suit the lifestyle we used to have or wish we have. To make this process easier, your first step is to make it fun. Give yourself time. Get a baby sitter if you have to, put on your favourite music and pour a class of wine. Step 2: Start by taking out the items you really love to wear. These will be the pieces that fit you well and make you feel fabulous when you wear them. Let these pieces set the precedent for future decisions. Step 3: Create 3 different piles; one for items you may want to keep, one for items that no longer fit your body, personal style or lifestyle, and one for items that are damaged. Take out each item from your closet and put it in one of these three piles. Remember, if you haven’t worn it in the last year, you probably won’t wear in the future. Be honest with yourself. Step 4: Critically go through each item you have in the keep pile. Try each one on and make sure it fits you well and represents your personal style. Compare these items with the pieces you set aside that you love. If they don’t match up, they must go to the ‘no longer work pile’. Step 5: Give away or sell all the items that no longer work for you. Many people find it hard to give away items they have bought, but never wear. Just remember, that you need to get rid of what don’t work for you, so that you can make space for what does. The only items that make it back in your closet should be things you love and actually wear.